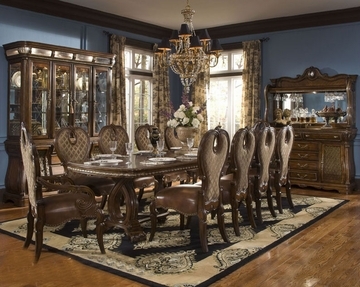 AICO Dining Set Sovereign AI-57002-51s. The opulent, and posh The Sovereign group brings the influence of European antiques to life with traditional carvings, detailed looping, harlequin marble, and a subtle cafe latte finish called Soft Mink. 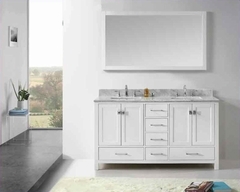 Solid birch is used throughout the collection because of its close grains, and satiny texture, and the carefully applied café latte finish enhances the natural beauty of the wood. Soft curves, hand carvings, and silver and gold tipping are harmoniously tied together with decorative hardware, while drawing influence from classic European architecture.